At the risk of losing my Canadian citizenship, here is yet another baseball jersey design. This time it’s for Mega Man, a video game icon beloved by everyone. To complete this jersey a long-sleeve royal blue shirt would be worn underneath to replicate Mega Man’s forearms. A blue ballcap too maybe? 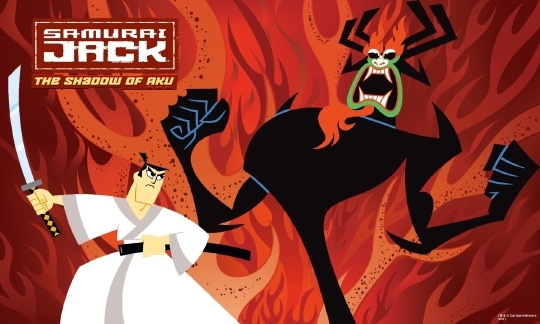 Samurai Jack has been off the air for 10 years, and it feels like a tie-in movie has been in development for twice that, but I digress. I’m a big fan of the show, so I’m happy to finally post some sort of tribute here. I wasn’t able to use Jack for a hockey jersey, however his outfit is a better fit for a baseball jersey. His eyes reflecting off the sword will look cornball to non-fans of the show, but his eyes being framed like that is one of the show’s big calling cards. No plans to offer this one, mostly because Samurai Jack is not as popular as I would like (a lot of folks still haven’t heard of it).